"Chelsea’s last wish before she passed away was that we, her Mummy and Daddy help, other poorly children with this disease"
Chelsea’s last wish before she passed away was that we, her Mummy & Daddy, help other poorly children with this disease. For a 3 year old she was a very mature little girl who knew what she wanted. 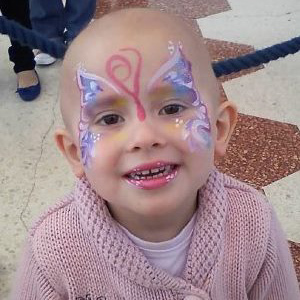 Our daughter was diagnosed with a childhood cancer Neuroblastoma in 2007 at the age of 2. We watched her with spirit and courage fight her battle for nearly 2 years. We spent over a year trying to raise funds to take her to America for potentially life saving treatment. But we sadly ran out of time as the disease took hold of our little girl around June 2009. Chelsea lost her brave fight on 9 August 2009, but before she passed away, we promised her we would help other poorly children just like her. Providing the child and parents/siblings of that child with a rare respite breakaway/or some kind of recreational help for that child. Purchasing of additional medical equipment to facilitate the care and day to day living of a child with cancer. We can’t do this alone, and for just £5 you can help us to bring smiles and create memories for children and families bravely battling through illness. Text CHEL03 £5 (or the amount you want to give) to 70070.